Sikkim is divided into four districts which are North, South, West and East district. Gangtok, the capital of Sikkim is located in the East District. 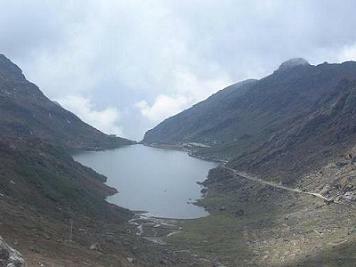 There are various places in Sikkim which offers more than natural beauty. Mountains, lush green forests, gurgling streams and the rich flora and fauna are all there in Sikkim. Gangtok is a cosmopolitan and capital city of Sikkim, situated on a ridge. Gangtok has undergone rapid modernization in the last two decades and contains all modern facilities. There are various places of sightseeing in Gangtok like Research Institute of Tibetology, Phurba Chorten and the Ridge, Ganesh Tok, Pinetum, Tashi View Point, Changu Lake, Menmecho Lake, Yumthang Hot Springs. The Sikkim Research Institute of Tibetology is a premier institute in the world that was established to conduct research on the language and traditions of Tibet as well as the Mahayana sect of Buddhism. This institute houses a museum, a Tibetan library and a general reference centre. This research institute is situated at Deorali. 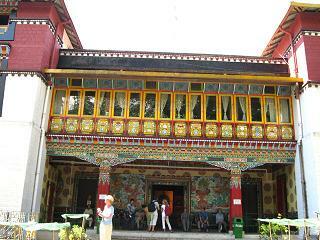 The institute contains a rare collection of the Tibetan literature, manuscripts, paintings, coins, Thangkas and statues. Phurba Chorten is situated close to the Research Institute of Tibetology on a small hillock. This huge and towering religious monument is in the form of a stupa. The periphery of the Chorten is surrounded by 108 small prayer wheels with the mystic mantra ‘Om Mane Padme Hum’ in Tibetan inscribed on them. The Chorten was built by Late Trul Shik Rimpoche, who was the head of the Nyingama Order, and late Chogyal of Sikkim Tashi Namgyal. Inside the Chorten are placed a complete set of Kagyur holy books, relics, complete mantras and other religious objects. The Ridge is a small stretch of plain and flat road above the town of Gangtok. It is just about fifteen minutes walk from the main market. The ridge is lined with plants and trees which when in bloom present a colorful picture. The Ridge has the White Hall and the Chief Minister’s official residence on one end and the beautifully designed Place Gate with a pagoda rooftop on the other end. A resting shed built on Tibetan architecture is also situated on the Ridge. Flower shows which attract tourists from all over the world are held just below the Ridge. Ganesh Tok is located on the hill adjoining the TV Tower. A small temple dedicated to the God Ganesh is situated on the hilltop at an altitude of 6500 feet. From the Ganesh Tok one can have a panoramic view of Gangtok and the Raj Bhawan Complex. The Pinetum garden is situated near the Ganesh Tok. This garden contains pine trees and a walk on the foothpath amongst the pine trees is refreshing. Hanuman Tok is situated about five kilometers uphill from White Hall on the Gangtok Nathula Highway. A temple dedicated to the God Hanuman is situated at an altitude of 7200 feet. On the way towards the temple, one can have a breathtaking views of Gangtok and the adjoining rolling hills. Tashi View Point is situated about six kilometers away from Gangtok on the North Sikkim Highway. This place offers an astounding view of the Kangchendzonga snowy range. The Phodong and the Labrang monasteries can also be seen on the opposite hill. A resting shed situated at Tashi View Point provides shelter to the tourists. The Changu lake is situated about 35 kilometers from Gangtok at an altitude of about 12000 feet on the Gangtok – Nathula highway. This lake is situated in the restricted area and hence an Inner Line Permit is required by Indians to visit this place. Foreign nationals are not permitted to visit this lake. Its cool water, flowers and the alpine vegetation harmonises with the scenic beauty around. A small temple of Lord Siva is also constructed on the lakeside. Because of the high altitude, heavy woollens are required to be worn here throughout the year. A beautiful natural cave called the Tseten Tashi Cave is also located near the lake which is about three storeys high. The Menmecho Lake is another beautiful lake that is located about twenty kilometers ahead of the Changu lake. This lake is very big in size, and lies cradled between the mountains below the Jelepla pass and is also the source of the Rangpochu river. The lake is known for its fish and a farm to cultivate these fish is also situated nearby. Kechopari Lake is located on a bifurcation on the road between Gyalshing and Yoksum. Kechopari means the Wishing Lake. The water in this lake is very calm and crystal clear. Not even a leaf can be seen floating on the water although a beautiful dense forest lies above the lake. It is said that if a leaf even drops on the surface of the water it is picked by a bird. 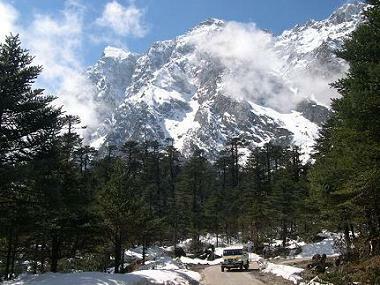 Yumthang is situated at an altitude of 12000 feet, about 135 kms from Gangtok in North Sikkim. Yumthang is located on a flat valley, near the tree-line. The surrounding mountains here seems to touch the heavens and one has to turn the face vertically upwards to see the mountain tops. Yumthang is well known for its hot springs which are rich in sulphur content. To reach these springs one has to walk a few hundred yards from the road and cross a bridge on the River Lachung. For the convenience of bathers a hut has been constructed with two pools in which the hot spring water collects. There is a Forest Department Rest House in Yumthang. Phurchachu Reshi Hot Springs are located about 25 kms from Gyalshing near Reshi on the River Rangit. One has to walk about ten minutes from the highway across the River Rangit by a pedestrian bridge to reach the hot springs. The water of these springs has medicinal value as it is very rich in Sulphur that can cure various skin diseases. Rabdanste is located about 1 km. away from the Gyalshing bazaar and near the Pemayangtse Monastery. 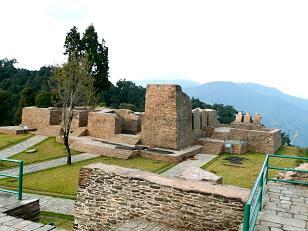 Rabdanste was the second capital of Sikkim and was established in the late seventeenth century by the second Chogyal because of the threat posed by the Nepalis and the capital was shifted to Tumlong. The Rabdanste Palace is now in ruins but the chortens found around the palace are not in ruins. To reach the palace one has to trek for about two kilometers from the main road near Pemayangtse Monastery through a thick forest. The ruins are being preserved by the Archaeological survey of India and have been declared as a monuments. Yuksom literally means the meeting of three great lamas. These lamas came from Tibet and established the Nyingmapa order of Tibetan Buddhism. They also consecrated the first ruler of Sikkim in Yuksom. Yuksom is also the entry point of the Khangchendzonga National Park. Yuksom is the base camp for various trekkers and the mountain climbing course organized by the Himalayan Mountaineering Institute.